Predicted Man City XI vs. Leicester: Kompany to make shock return next to Stones? Manchester City take on former league champions Leicester City at the King Power Stadium on Saturday. The obvious notable City absentee is Benjamin Mendy, who recently returned to Manchester to continue his recovery. Nicolas Otamendi is suspended for this one too, having picked up one too many yellow cards this season. Fabian Delph and Vincent Kompany are both doubts (for the purposes of this predicted team I’ve taken a risk and assumed they’ll be fit). It’s worth noting that Raheem Sterling and David Silva have both had minor injuries over the last few weeks, but Pep suggested in his press conference that they’ll both be OK to start at the weekend. Let’s start with a real shocker – I reckon Ederson will start in goal. The Brazilian isn’t exactly sweating over his place, is he? He looks a real bargain and among the best ‘keepers in the league already. At right-back, it’ll be Kyle Walker (sorry Danilo). Fitness is probably the only thing that can keep Walker out of the team right now, as the league’s outstanding full-back for the last few seasons. Mirroring him will probably be Fabian Delph, the makeshift left-back who’s taken English football by surprise this season with some wonderful out-of-position performances. Delph pulled out of the England squad with a minor injury a fortnight ago, but is expected to return on Saturday. John Stones joins the party at centre-back looking to continue his best ever start to a season. He played two full games (and kept two clean sheets) for England over the international break but will probably be OK to start here, perhaps with a view to resting him against Feyenoord in midweek. But what about next to him? Well, after weeks of (perhaps somewhat harsh) panic at the prospect of Eliaquim Mangala lining up against Jamie Vardy, it looks like City fans could be rescued by the well-timed return of Vincent Kompany, who I expect to take the captain’s armband and slot neatly back into the team after an absence in which, to be honest, he’s rarely been missed. In front of them, Fernandinho will almost certainly be back in the team. He’s one of the first names on the teamsheet by now, surely? I’ve no idea where we’d be without him. 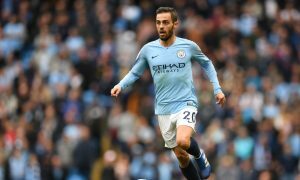 He’ll be feeding David Silva and Kevin De Bruyne, the league’s two most creative players, who no team can live with on their day. Silva picked up what appeared to be a minor neck injury while on duty with Spain last week, but played half an hour in their next friendly, so it’s safe to assume he’s fine. The front three is where predictions get interesting. Leroy Sané, fresh from his Player of the Month win for the Premier League in October, seems certain to line up on the left wing, while Raheem Sterling is expected to edge out Bernardo Silva down City’s right. But who will start up top? Gabriel Jesus played in both of Brazil’s international friendlies – Japan and England – while Sergio Aguero completed almost as many minutes for Argentina. As was widely reported after their 4-2 loss against Nigeria earlier in the week, the striker suffered from dizziness at half-time and was taken to hospital, but recently announced on Twitter that all was well and he was fit to play on Saturday. However, I expect Gabriel Jesus to lead the line against Leicester, with Guardiola opting for the youngster’s superior movement and pace over Sergio’s killer finish. As for the bench, well it pretty much picks itself. Claudio Bravo, Danilo, Eliaquim Mangala, Yaya Touré, Ilkay Gundogan, Bernardo Silva and Sergio Aguero are my picks to make up the substitutes for Pep – not for the first time this season. With that said, I wouldn’t be surprised to see any of the latter three starting against the Foxes. Whatever team we put out, it’s likely to be an exciting game with plenty of goals – hopefully all for City!